1. The Little Nell Hotel, Aspen, Colo.
2. Terranea Resort, Rancho Palos Verdes, Calif.
4. The Signature at MGM Grand, Las Vegas, Nev.
5. Mii amo Spa at Enchantment Resort, Sedona, Ariz.
Oceanfront accommodations. Need I say more? Need a getaway from stressful family reunions and holiday overeating? Tack a relaxing and luxurious retreat onto your vacation. Unfortunately, we can’t always afford luxury prices. We can, however, try to find the best bargain. “Deals depend on hotel availability and what time of year you are willing to travel,” says Elie Siedman, CEO of hotel review and booking site Oyster.com. This holiday season, de-stress at one of these 8 luxurious destinations for a price that won’t break the bank. This holiday season, witness a winter wonderland in Aspen, Colorado. “Now this is a deal,” says Dan Sherman, director of communications for Ski.com. “Third night free: I’ve never seen a deal like that at Little Nell.” From Nov. 25 to Dec. 15, Ski.com offers a package for $502 per person, which includes a 3rd night free and a 2-day lift ticket. This iconic hotel is one of the best ski-in, ski-out hotels out there. “After a day of skiing, I love sitting by the fire in the lobby, having a drink, and watching the world go by. It’s a great place to be seen and see people” says Sherman. And with the airport right in Aspen, this hassle-free getaway begins as soon as the plane lands. Find more snowy steals at www.ski.com. This hotel sits comfortably atop a Californian cliff, overlooking the ocean and providing some of the most breathtaking views in southern California. Breathtaking beach views, spa visits and a convenient close-to-L.A. location make this resort newcomer the "it" destination in southern California. Reign in the holiday cheer with gingerbread sand castles and holiday-themed 5K running races and golf outings. Travel with the entire family and stay in a luxurious villa with up to four bedrooms starting at $715/night (regular rates start at $1,160/ night midweek and $1,520/ night on weekends) from Nov. 15 to Jan. 1. “Terranea is an absolutely beautiful property with great pricing promotions,” says Barbara Messing of Hotwire's Travel-Ticker.com. “It’s a great place to splurge.” Find exclusive deals at www.terranea.com/california-resort-traditions.php. 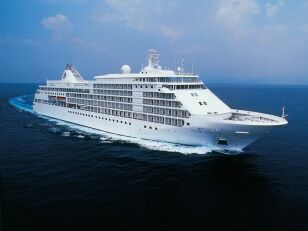 Silversea's small ships "feel more like a luxury yacht than a cruise ship," says Silersea spokesperson Brad Ball. Enjoy the cream of the cruising crop with one of Silversea's exclusive voyages. Silversea is an understatement; platinum is more like it. The Dec. 3 South American voyage is a 17-day journey aboard the Silver Whisper, built to accommodate 386 guests. Start in Valparaiso, Chile, and continue your voyage through Puerto Montt, Laguna San Raphael, The Chilean Fjords, Puerto Madryn, Argentina and conclude in Buenos Aires. At a 60 percent discount, this voyage is a whopping $6,998, airfare included. “Silversea is all-inclusive; even gratuity is included,” says Silversea spokesperson Brad Ball. “We can dock at great destinations because our ships are smaller than mass market ships.” With just 300 to 500 passengers, this intimate 5-star accommodation “feels more like a luxury yacht than a cruise ship,” says Ball. Enjoy spectacular views and suite accommodations at this newer Las Vegas hotel. “The excess of 5-star rooms in Las Vegas creates great values. December is a win-win for the consumer in terms of seasonal demand,” says Travelticker.com’s Messing. The new Signature at MGM Grand is “a great opportunity because all rooms are Junior Suites,” says LuxuryLink.com President Diane McDavitt. 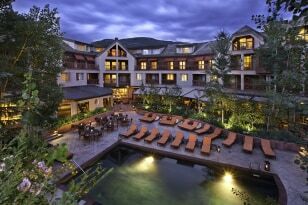 Regularly priced at $467, get this three-night package for a whopping $234. And the suite can accommodate up to four guests, so bring your friends. Find this deal at LuxuryLink.com. 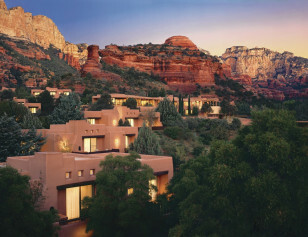 Sedona's beautifully relaxing landscape makes this destination spa a wonderful place to de-stress. “The surrounding red rocks provide a mystical, spiritual kind of feel,” says John Clifford, luxury travel expert. “Really fantastic location and accommodations.” You can choose from three, four or seven-night packages that include tranquil spa accommodations, three gourmet meals per day, fitness classes, and more. Enjoy spa treatments ranging from 90-minute massages, hydrotherapy baths, and even Native American-inspired restorative therapies. Book through Jan. 31 and get the lowest rates of the year at $2,190, which includes meals, hotel and spa accommodations. But beware — there is limited availability, so act fast. You can find more enchanting deals at: www.miiamo.com/packages/journey-rates/. “As far as luxury on Paradise Island is concerned, One and Only Ocean Club pretty much is the one,” says LuxuryLink.com’s McDavitt. A well-known destination for luxury, The One and Only Ocean Club in the Bahamas offers four nights for the price of three. Average nightly rates begin at $430, which includes $200 resort credits, $50 spa certificates, a free round of golf and more. Book by Nov. 27 and enjoy this deal through Dec. 18. Find rates at oceanclub.oneandonlyresorts.com. 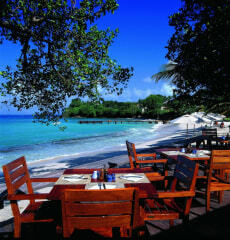 Enjoy complete tranquility on the beautiful, less traveled beaches of Mustique Island. From now through Dec. 17, enjoy seven nights for the price of five or five nights for the price of four. Packages start at $2,460. This island getaway will provide peace and tranquility amidst the Caribbean Sea. For ultimate relaxation, complete your stay with a one-hour Swedish massage or simply walk the beaches to fully capture the essence of this small, secluded island. “The Grenadines is a great choice for an off-the-beaten path, authentic experience,” says McDavitt. Find rates and deals at cottonhouseresort.com/specials. Jet set to Paris for an authentic European holiday without the large crowds of visiting tourists. The Louvre and Eiffel Tower await your arrival. Dreaming of Paris at Christmas time? Make that Parisian dream a reality at The Hotel Mon, a lux contemporary accommodation in the heart of Paris. Regular rates begin at €273 and with a minimum four-night stay, get one night free. Get a five-night stay normally priced at $2,424 through LuxuryLink.com for $1,799 from now until Feb. 28 Airfare costs and visiting tourists are at an all-time low through the winter months, making the holidays a great time for a European getaway. With in-hotel spa amenities, you can de-stress for less in one of the world’s most beautiful cities. Find these deals at Monhotel.fr and LuxuryLink.com.